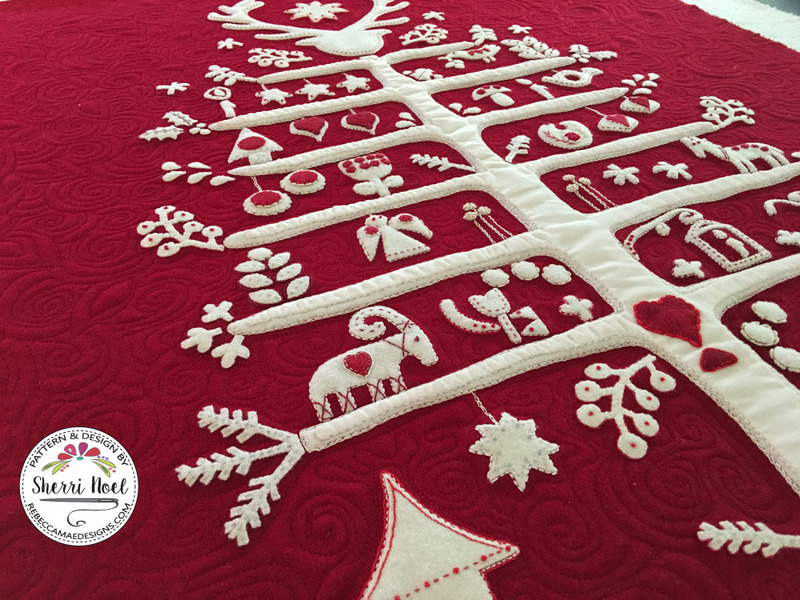 Jul i Scandinavia Christmas Quilt wrap up! 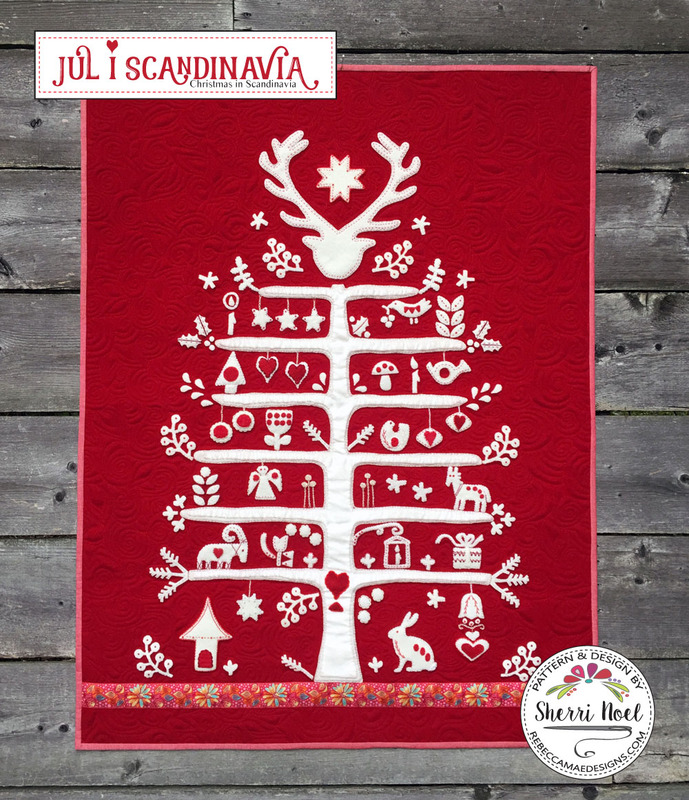 I am over the moon excited to share my Jul i Scandinavia finish with you!!! Let’s get right down to it! I’ve been working hard on this quilt all year and it’s really been a joy! I’m so happy with how it’s turned out! I added the final details to the top, and the pattern is now complete! Wool kit – pattern, wool, binding, ribbon, 2 balls pearl cotton and chenille needles. I was SOOOO nervous to quilt it, as a matter of fact I did ask around to see if I could have someone else quilt it for me ~ but in the end, no one was available so it pushed me out of my comfort zone and now I feel really proud of my finish! 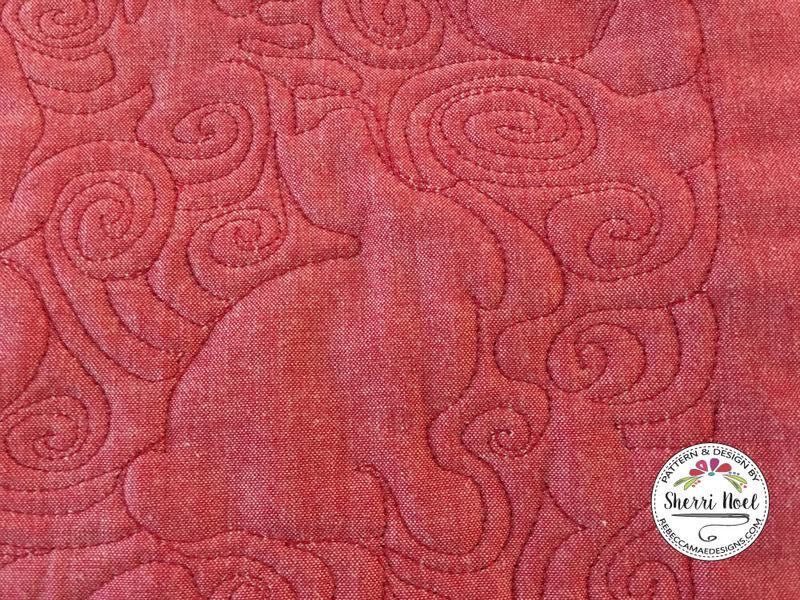 2) Use the same color thread to match the quilt top (red) and consider using a silk thread or something shiny. I used red Glide thread (100% poly) in the top and the bobbin. 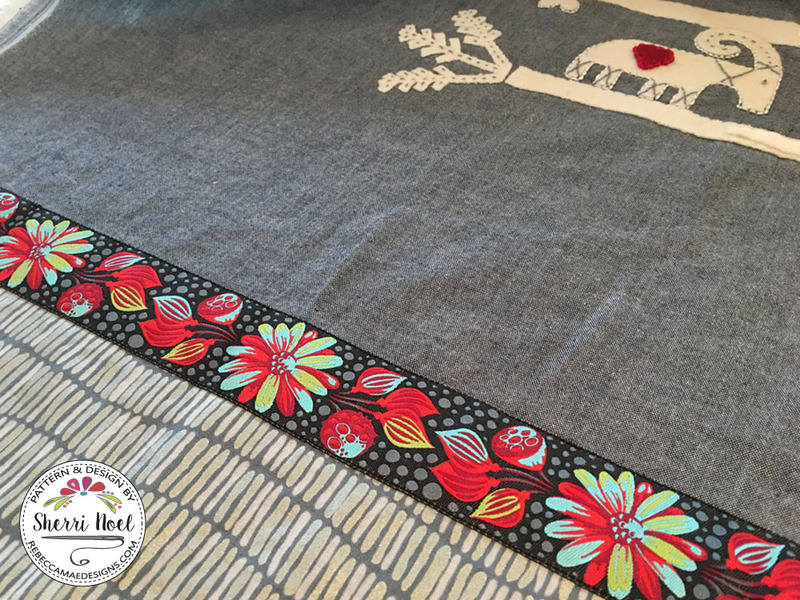 I have recently tried this thread on other non-wool quilts with great success. It’s shiny and I love the little extra sparkle it gives my quilt! 3) Use felt or a cotton batting to help the project lie flat ~ I used one layer of cotton batting. 4) Before you begin, practice with a sample quilt sandwich made from the same layers in project. This really helped me feel more confident quilting wool for the first time. 5) Try your best not to stretch the wool when you’re quilting. 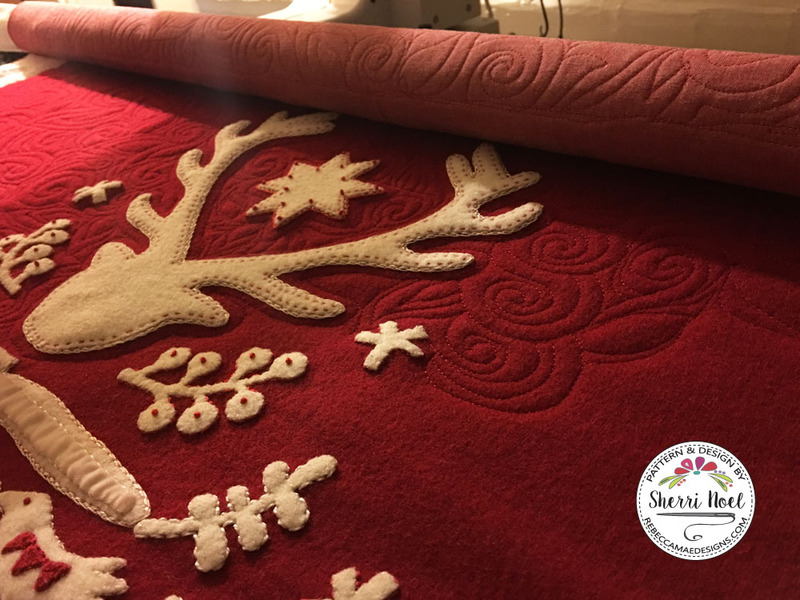 I took a deep breath and started quilting around the deer head, echoing the silhouette and filling in with swirls and leaves, trying to keep them consistent, and I scaled the same design smaller around the applique… slow and steady. By the time I made it to the bottom of the quilt I was feeling a bit more relaxed, and I couldn’t wait to take a look at it all finished! Here it is, hot off the quilt frame! It’s so dreamy! I am so thrilled with how it came out… and look at the back!!!! So FUN! How cool is that! I just love seeing all the silhouettes! 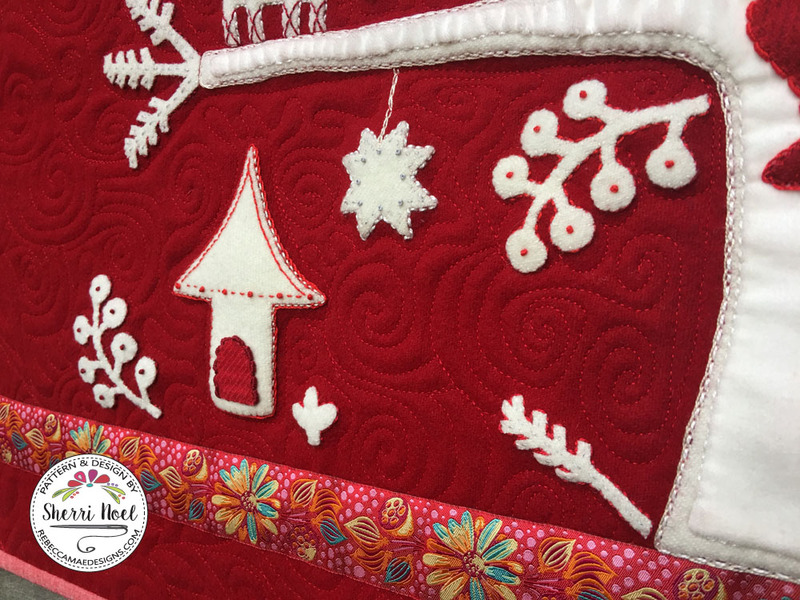 If you are wondering if you can make this using quilting cotton or cotton and wool, the answer is yes! 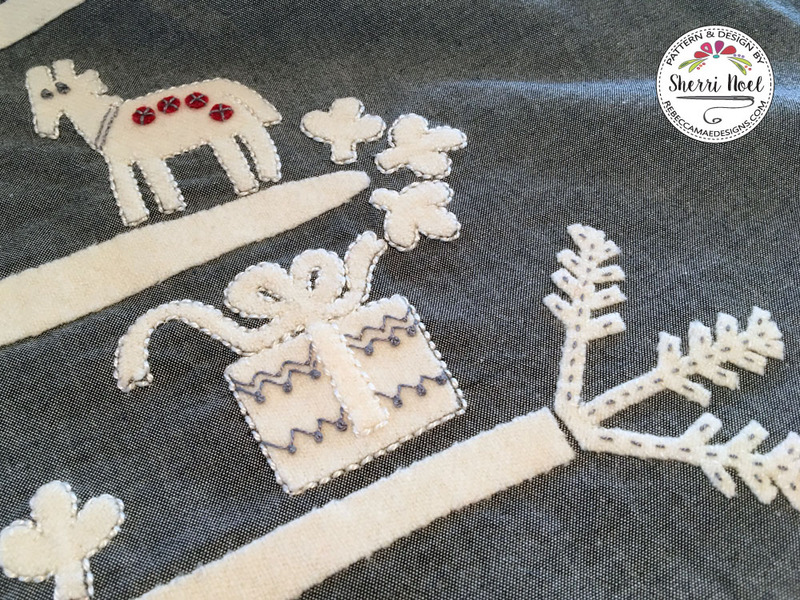 I participated in a wool robin with some friends from my quilt guild this year and they started another tree for me using gray cotton with white and red wool! Here is a sneak peek!!! This one uses the Midnight Sprout Ribbon from the bundle in my shop. They got me off to a great start! I have to finish this version for our guilds quilt show in March – Wish me luck! Thanks so much for following along!! 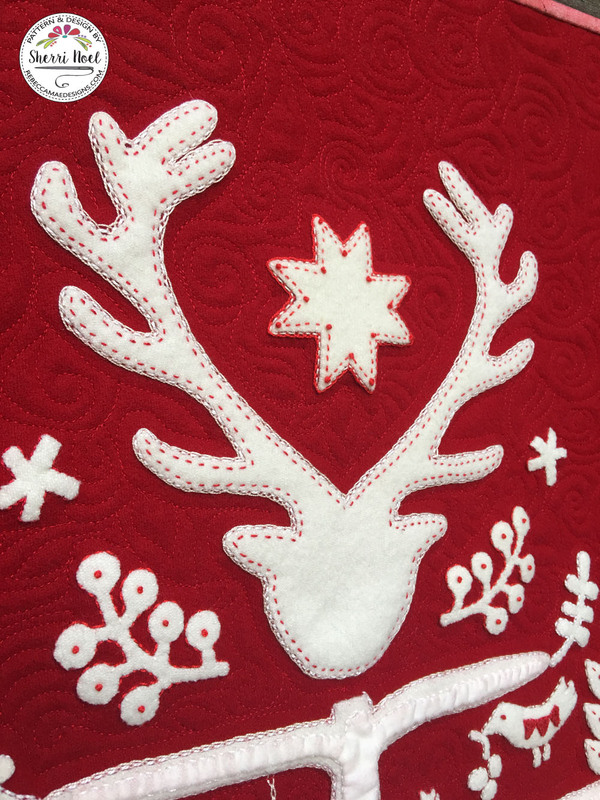 Jul i Scandinavia Block of the Month ~ March! 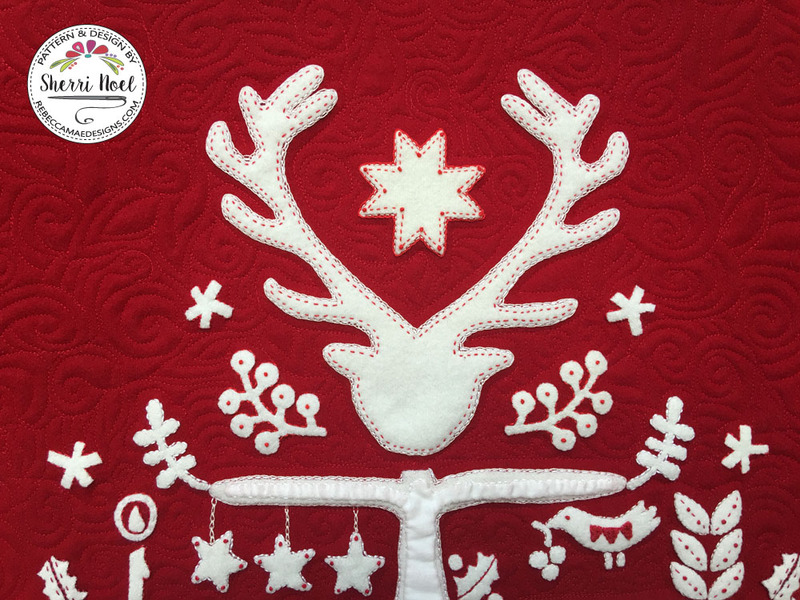 Jul i Scandinavia Block of the Month ~ February! The quilt is beautiful! And….your quilting is great. Thx for the tips you passed along for quilting on wool. I have to quilt my wool robin before March, too. I can’t wait to see the “gray” version. As always…..you are such an inspiration! 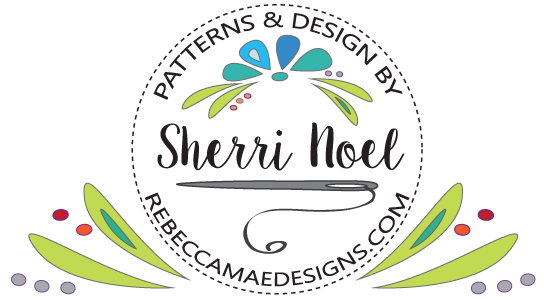 Copyright © 2019 Sherri Noel.All rights reserved.